More tile! Tile will start to seem very boring to you very soon, I'm sure. But, unfortunately, tile excites me very much right now. 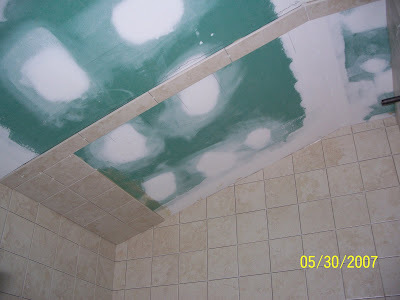 Isreal has completed all 3 bathtub walls (except for tile detail cuts for around the fixtures and the grout). 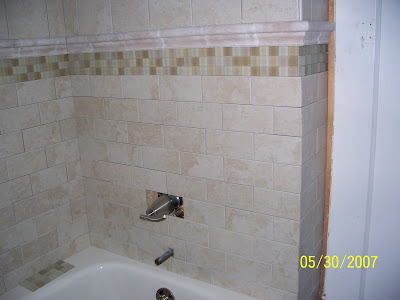 The tile was also started on the area above the tub. By tomorrow the whole tub area will be done! One negative came up today. We are running short on the 3x6 brick shape tile that you see on the bottom half of the tub wall. 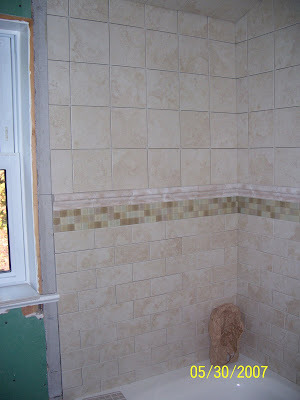 The plan is for the tile from the chair rail down to continue around the rest of the room. It looks like we ordered about 1/2 as much as we should have. This is because of yet another miscalculation by Nick (our old supervisor). He's gone from our job... but his work just keeps reappearing! I called the tile store today to see about getting more tile. Not a problem to get more... but since the location we used is only a showroom they don't store any tile. If they get it shipped from the other store it won't be in until next Wednesday. Too long to wait... that would add yet another week to our job. So, I planned to drive the hour away and the hour back to pick up our order and ensure we'd have the tile tomorrow. Fortunately, Bill (the owner of Handyman Matters) said he'd have one of the guys drive down to pick it up. That makes me VERY happy. Zoe has school tomorrow (9-12). I was going to get the tile then... and I know I would stress the whole time over whether I'd make it back for pick up time. Hopefully things will continue smoothly.